‘Our school has an annual ‘Fantasy Fashion’ event, a charity fundraiser where pupils design and produce fantasy fashion outfits around a given theme, culminating in a fashion show complete with catwalk. We like to create library displays to tie in with school events, and for this year, bought some new books on fashion, design, creative textiles etc. Mr Chan, one of our librarians, has created an incredible display that is placed right at our main entrance. We’ve extended the theme by incorporating and adapting well known book titles – so we have ‘A Streetcar named Denim’, ‘To Kilt a Mockingbird’, ‘Tender is the Nightgown’, ‘All the King’s Menswear’, amongst others! He has also dressed a mannequin using withdrawn books, and this will be placed outside the library to publicise a competition, ‘Strike a Prose’, where pupils are invited to write a piece around the year’s theme. It will be interesting to see if extending our display beyond the library itself will bear fruit. We are hoping that the mannequin itself will take part in the fashion show, possibly on a set of wheels! This is one of the most beautiful and innovative displays – especially the mannequin! – that I have seen for a while. 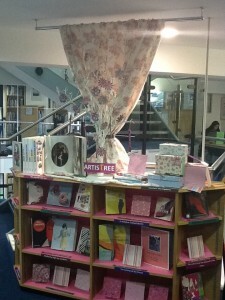 Don’t forget if you have a great display in your library, we would love to share it on Heart. 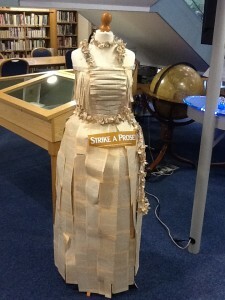 This entry was posted in Displays, Events by Caroline Roche. Bookmark the permalink. What a fantastic way to use old stock! We’re celbrating Book Week Scotland with a Narnia-inspired week, and I can now see us creating a Snow Queen dress out of the pile of wihdrawn books that’s sitting behind my desk.